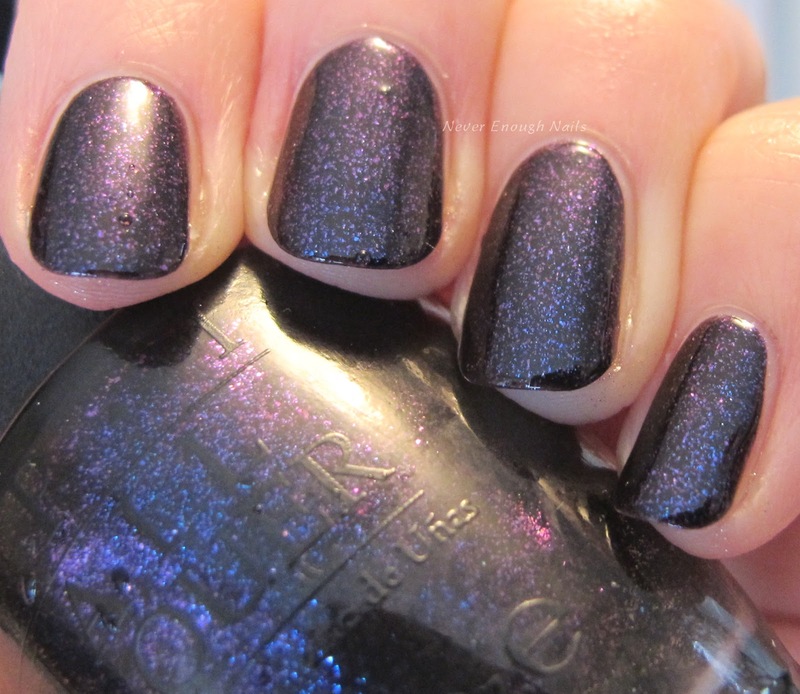 Never Enough Nails: OPI Starlight Holiday 2015, Part II! I'm kicking off part II of my OPI Starlight swatches with my favorite polish of the collection so far, OPI Give Me Space. 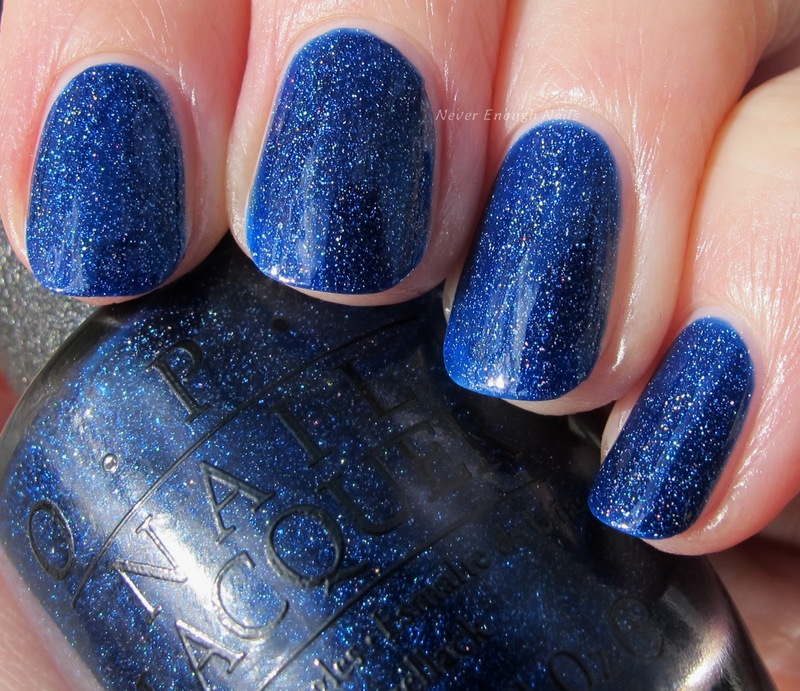 Give Me Space is a rich velvety cobalt blue with scattered holo shimmer. This looks like a beautiful night sky in the winter, clear and crisp. I really love this one! This is three thin coats of Give Me Space. You would probably be fine with two regular coats, but I tend to do thin coats, so I still had some VNL at two. It was really easy to apply, the perfect consistency. I barely had to do any clean-up. OPI By the Light of the Moon is a silver metallic shimmer with silver hex glitters. This is a pale silver, kind of like silver mixed with some shimmering white. The hex glitters are several different sizes and there is some teeny silver microglitter in the base as well. This is two coats of By the Light of the Moon with one coat of Essie Gel Setter on top. It was smooth to the touch with one layer of top coat, although it does look a little textured still. It was pretty easy to apply. I know a lot of people weren't big fans of this, but I kind of like it. I like the twinkles of silver glitter in the silver foil base. 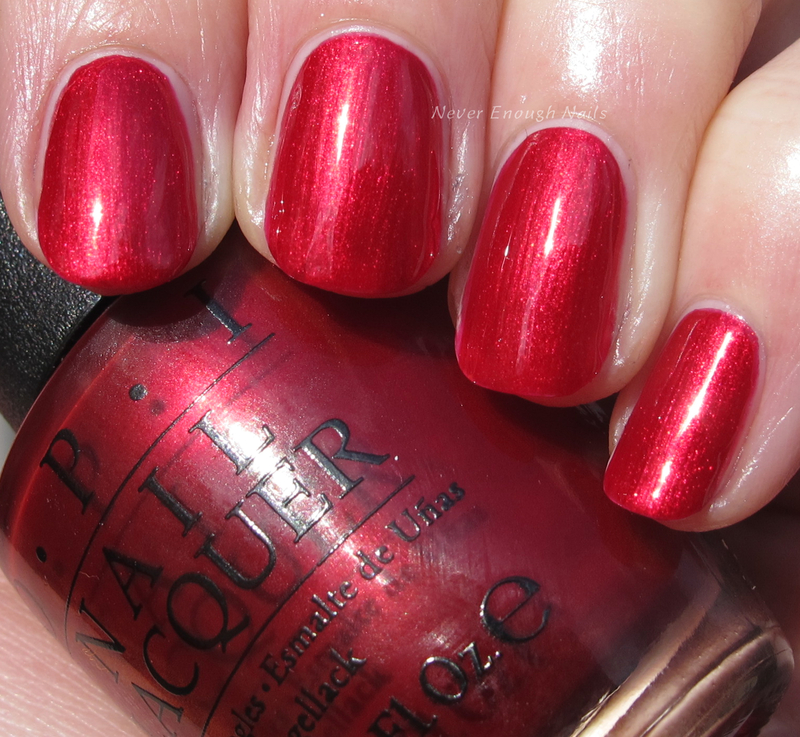 OPI Ro-Man-ce on the Moon is a classic OPI red shimmer. 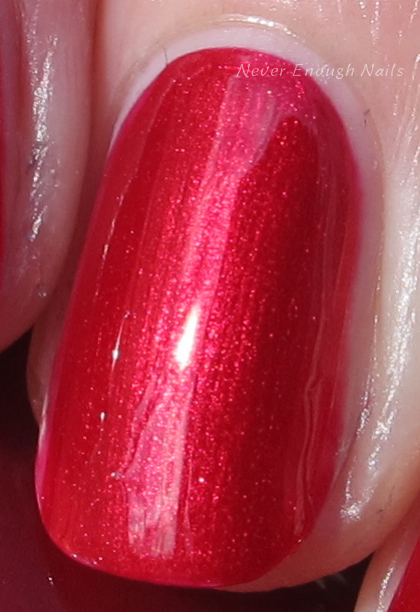 I just think other companies should quit making red shimmers, because OPI has them down to a science. They are always glowing and perfect, and they make me want to wear them, even though I rarely wear reds! I can't decide if I want to do this as my pedi tonight or Let Your Love Shine that I swatched the other day. 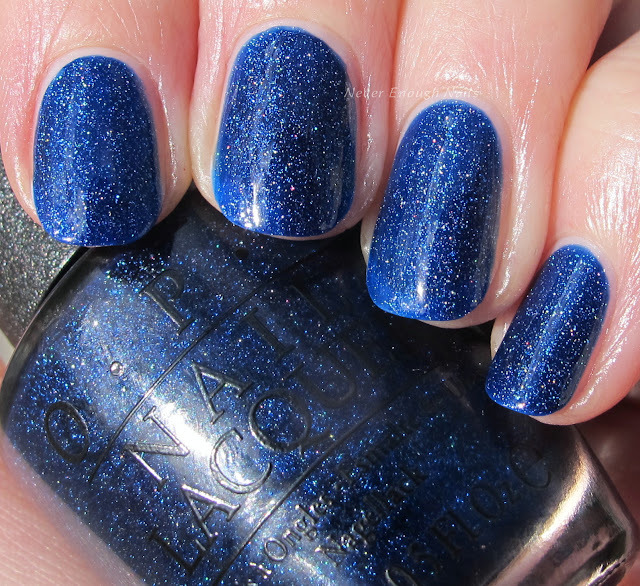 Ro-Man-ce on the Moon looks a little cooler toned than Let Your Love Shine because it lacks the golden shimmer of LYLS. This is two easy peasy coats of Ro-Man-ce on the Moon. It was a dream to apply and I did zero clean-up. Just what you need for a fast holiday mani! This pretty silver foil is OPI I Drive a SuperNova. I am always a big fan of silver polish, I wear it like it's a neutral color. Silver foils also tend to be nicely opaque, so they are easy to slap on when you need to be at that holiday party 5 minutes ago! This is two coats of I Drive a SuperNova, but it was pretty much opaque in one. I did two just for the camera because I think it looks a little richer. But I could easily wear this at one. This is a good formula and it's not as brushstroke-y as a lot of silver metallics. OPI Cosmo with a Twist is a really great alternative to all the holiday reds and metallics. This is a moody vampy blackened blue-violet with lots of flecks of bluish-silver shimmer. In some lights, this has nearly a duochrome effect. You can see kind of a red-brown plum base and the blue-violet color too. See my picture 2 below to see what I mean. See how there is a warm plum/pinky color and the blue-violet too? Very fun! This is two coats of Cosmo with a Twist. It has a nice formula and was easy to apply. The formulas in this collection seemed to be pretty much great. I have no complaints so far! What would a holiday collection be without a classic red creme? 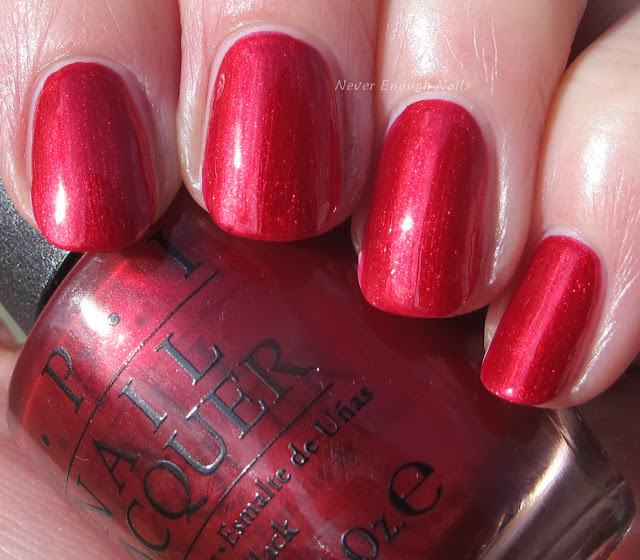 OPI Love is in My Cards is a warm red creme. 'Tis the season! Time to sound like a broken record- this is two easy coats! Like I said, no complaints here! My favorites in this set of swatches are definitely Give Me Space and Cosmo with a Twist. They are really beautiful and feel right for the season. That being said, one of the red shimmers is going to be the first polish I actually wear from this collection, because I am all about the red shimmers in December! I will have part III of my Starlight swatches up in a few days, hopefully on the weekend! The OPI Starlight collection is available now at Ulta and Ulta.com.